Les, a self-employed bricklayer was travelling home when a concrete lorry ran in to the back of his vehicle. This was an accident like many others but there was nothing ordinary about what happened next. As soon as the accident happened Les got out of his vehicle to check the damage. Fortunately, there was not too much damage given that the concrete lorry was carrying a full load. There was, however, some damage to the other vehicle so Les started to take some photographs with his phone. The other driver took offence to this and forcefully removed the phone from him and returned to his lorry. Les wanted and needed his phone back and so climbed in the other side of the lorry to retrieve it and was pushed out of the lorry by the other driver. Les landed awkwardly and he knew straight away that he’d broken his leg but didn’t realise the seriousness of his injury. The police and ambulance services were called and Les was taken to hospital where the extent of the damage was discovered. Les’ ankle had completed shattered and many pieces needed to be removed. He was fitted with a metal splint to ensure that no pressure was applied to the injury and this was later replaced with a supporting cage which he will have to wear for up to a year. 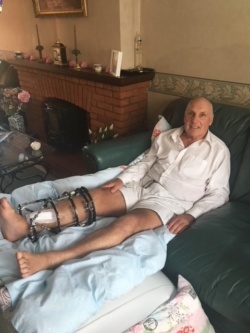 He now has one leg shorter than the other and will require another operation to take bone from his leg to replace the missing pieces in his ankle to try and lengthen his leg. Despite this, Les, who has been in the bricklaying trade for fifty years remains positive and wants to return to his bricklaying business as soon as possible. 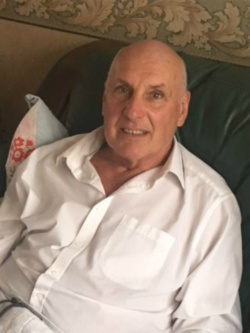 Les says “If it wasn’t for the kindness and generosity of the Lighthouse Club Charity in helping me and my family at such a dreadful time, I would feel very bitter about everything that has happened to me and the consequences of that day. But because of their support, I can let go of what has happened and concentrate on getting better and back on my feet again”. Les found out about the Lighthouse Club Charity through his son, Luke, who also works in construction. Luke had been referred to us by the Child Brain Injury Trust at Great Ormond Street Hospital when his daughter became critically ill. His daughter remains critically ill and requires round the clock care. Had it not been for the initial referral, then Luke and his father would not have been able to receive the support that they have. Les’ story highlights the need for every construction worker to carry one of our construction industry helpline cards, so they know where to turn to in times of need. Les and his son Luke received help because a totally non-related organisation took the time to see what support might be available for them. Without this, they would both be struggling with their situations as well as struggling to cope financially. If you’d like to know more about how you can support our work and help people like Les, visit our Support Us page.